Shively Labs deicers are designed to prevent ice from forming on radiating elements in mild to moderate icing conditions. The advantage of deicers over radomes is that deicer systems do not add a significant amount of weight or windload to an antenna system. However, they are generally more expensive to install and offer less physical antenna protection than radomes. Radomes also have the advantage of no operating costs. Shively Labs deicers are designed to prevent ice from forming on antenna elements and are not designed to melt ice that has already formed. For this reason, Shively Labs recommends that the system be installed with a dual setting thermostat assembly (Shively Labs Model 55522-G502) and controller assembly (Shively Labs Model 94068) that ensure the deicers are operated in the temperature range ice is most likely to form. 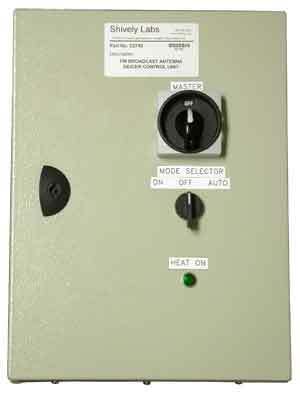 Technical manual for Shively Model 94068 de-icer control box (shown above) and Model 55522-G502 dual-setting thermostat. Download our Radomes Data Sheet here.